If you’ve been looking at getting into live streaming, it’s important to have the proper hardware for the job. Nobody wants to listen to a streamer who sounds like hes recording in the middle of an airplane. We’re here to help you find the best microphone for streaming that fits your budget and needs. FilmToolKit has put together a list of the top 5 desktop microphones to help you find the best microphone for streaming on Twitch, YouTube, or other platforms. As usual, at the bottom of the page we’ve included a section about the deciding factors when purchasing a microphone for your kit. 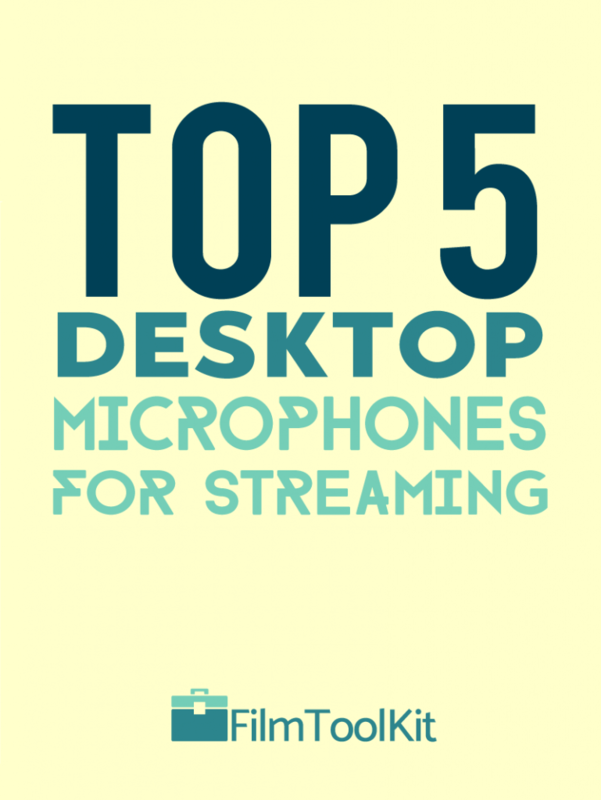 Otherwise, let’s jump right in to the top 5 best desktop microphones for streaming. 1.1 What Does This Table Mean? 1.2 Why Do I Need A Desktop Microphone? 3.2 Versatility – What are Polar Patterns? Frequency response range is a representation of what audio frequencies your microphone will be able to capture. Healthy, young adults typically have a hearing range of 20-20,000Hz. Lower frequency ranges than that will get the job done, and are usually quite a bit cheaper, but the audio fidelity will decrease. Do keep in mind however, that response range is far from the only factor in determining overall audio quality. Some desktop microphones will feature a mechanism to mute the mic, and potentially a headphone jack for monitoring. Live monitoring is a great feature because you’ll be able to hear your own voice with no latency, versus getting tripped up trying to listen to yourself through the lag of your computer. Some mics even allow you to blend the audio of your computer and your mic! We discuss polar patterns at length at the bottom of this article, but as a quick frame of reference, cardioid polar patterns are typically the best for streaming, and having more polar pattern options will give you added versatility if you do other things with your mic. Why Do I Need A Desktop Microphone? There are many reasons why a desktop microphone may be preferable to a more intricate setup with an audio interface. It’s Just One Purchase! – Purchasing an all-in-one desktop microphone means you don’t need to research and purchase an appropriate mixer, pre-amp, and stand. USB microphones take care of all the interface hardware internally, allowing you to simply plug and play! Ease Of Use – In addition to purchasing all that extra equipment, you would also need to know how to use all of it. Desktop microphones often have only one or two buttons and a single knob, meaning even your grandma could figure out how to operate them. They’re Affordable – You can quickly find yourself spending nearly $1000 on a full recording setup, but desktop mics give you everything you need for as low as $100! Portability – If you’re taking your recording setup on the road, it’s very convenient to be able to toss the device into your bag and be ready to go. If you’re looking for a high quality, easy to use microphone at a competitive price, it doesn’t get much better than this. The Blue Yeti Pro features a Tri-capsule array, or three condenser microphone capsules to ensure maximum versatility. These three capsules allow you to adjust the polar pattern of your microphone for a huge variety of different recording scenarios. This includes modes for stereo, cardoid, omnidirectional, and bidirectional recording. If you don’t understand polar patterns check out the guide at the bottom of the page! It also features a mute button, gain control, and a zero-latency headphone jack right at the bottom of the mic for monitoring of your own vocals. The entire body is constructed of metal, and feels pretty much indestructible. Considering how many features it has, the vocal quality of the Blue Yeti is outstanding, as you can tell from the mic test. Is the quality as good as a set up with a $400 mic, $200 Preamp and $200 mixer? No. Obviously not. But the audio fidelity of the Blue Yeti is on par with professional streamers, and is an excellent choice for any streaming kit. Massively popular YouTuber and tech guru Marques Brownlee heavily endorses this product and even used it to make many of his earlier videos. Blue has made it on this list twice because of their commitment to producing quality products and aesthetically pleasing designs. The blue snowball brings excellent microphone quality at a much lower price point. Featuring just two condenser capsules rather than three, the Blue snowball does not have the podcasting bi-directional features of its older brother. It does still have both cardioid and omnidirectional polar patterns however, making it the second most versatile device on this list! As you can tell from the recording quality above, the Blue Snowball packs a punch at a much lower price. The tripod is sturdy, requires no drivers and can be used almost immediately after being plugged in. One of the biggest selling points of the blue snowball is its unique form factor. The round design looks very appealing on your desk, which is actually something you may want to consider, as all the viewers on your stream will see it as well! It comes in two primary colorways, white and black (It’s not actually blue), so you can coordinate it with the rest of your streaming setup! There are also prettier Neon Green, Bright Orange and Electric Blue colors at higher prices if color is something you are willing to pay more for. The one issue people appear to be having with the snowball is that about 5% or less have issues with being too quiet or having difficulty connecting. These models appear to be defective and are returnable, so it won’t stop us from recommending this microphone. Fun Fact: This microphone is actually used by one of the most popular streamers of all time, Syndicate. So if it’s good enough for him, It’s definitely good enough for you. This is the most expensive microphone on our list, floating around $150 at the time of this review. While you might not be getting exactly as much bang as your buck, this microphone makes it on our list because of its superior audio quality. This Cardioid condenser microphone features a 0 latency headphone jack with volume control, mix control, and very high quality internal amplifiers and converters. The stand is of superb quality and is very stable, and the mic feels very rugged and sturdy. Many reviewers say that the quality of the AT2020 USB blows the Blue Yeti out of the water. Judging by the audio samples we examined, they are right. If you have got a little more money to spend this is definitively the best streaming microphone for you. In terms of complaints, a very very small percentage of users have complained that the microphone is very sensitive in a room that is not properly sound treated. We believe proper adjustments can resolve this issue and that you shouldn’t experience this problem if you purchase an AT2020. The AT2020USB is praised by many as an extremely versatile microphone you can record almost anything with. For the budget we are catering to in this buyer’s guide, this is as good as it gets. The Audio-Technica ATR2500 is the best choice priced in between the Blue Snowball and Yeti. Like the Blue Yeti and the AT2020, the ATR2500 features a headphone jack so you can directly monitor your output without delay. It offers a higher level of audio fidelity than other options at the same price, albeit with a lower quality control standards. There seems to be a small group of individuals who experienced issues after a month. Many are reporting that almost immediately after the one month return policy expired their microphones stopped getting recognized by their computers. The microphone stand has also been criticized a lot for its quality, so if you already have a microphone stand, this is a good pick for you. While that sounds like a deal breaker, the vast majority of reviewers seem to be very happy with the microphone and are very impressed with its cost to audio quality ratio. We’d say if you have the money, spring for the Yeti or the AT2020. Otherwise, The ATR2500 is a good value if you need a condenser microphone at the $60-70 price range. If you happen to find this microphone on sale or at a lower than average price, it could be a really good pick! Perfect for gaming or streaming. April 2019 Update: While reviewing this site to bring it up-to-date for 2019, we replaced most of the lower-end choices. In most cases, either reviews slipped, or the product was taken off the market. However, the Fifine is still by far the best thing available! It held up great! Wow! Honestly when I heard that for the first time I could not believe that sound was coming from such a cheap microphone. Yeah, there are no listing of the stats anywhere on amazon or on Fifine’s website. However, that doesn’t mean that this isn’t a great value for the price. If you’re absolutely broke but are desperate to launch your streaming career, this microphone is the best way to do that. Coming in at under $30, the Fifine Metal Condenser USB Microphone will fit in just about any budget. It’s pretty light on the features, It has a knob to adjust gain, and a cardioid polar pattern. We were impressed with its metal construction and surprisingly stable tripod stand. It is a breeze to implement and operate as there are no drivers, just plug and play! Considering the extremely low asking price, the performance of this microphone is very impressive. 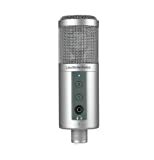 A few reviewers even stated that it ended up being of higher quality than other microphones up to $100. The quality will not match that of the blue yeti, or even the blue snowball for that matter. But, for less than $30, this is perfect for beginners who just want to dip their toes in the water without a large investment. It’s also great if you need a microphone to skype with your family or communicate with your team in a game! Aren’t XLR microphones better than USB ones? Sort of. In some ways. Greater Variety – An XLR mic exists for every audio solution you could possibly need. Upgrade-ability – There are many ways to upgrade your XLR recording setup, while with USB microphones you’ll have to buy a whole new mic. Easier to troubleshoot – If you have a problem, you can test your interface, cables, or mic to figure it out and fix it. Much easier to record multiple microphones – If you’re hosting a show with 3-4 inputs, you’ll want to use an XLR setup. Not tied to computers – can record onto external recorders, cameras, etc. So why did we even bother to make a list of the desktop USB microphones? The answer is simplicity, ease of use, and price. Odds are, if you managed to find this article, you don’t even know what an XLR cable is. And that’s okay. Not everybody has the patience to learn about audio interfaces, cables, pre-amps and microphones. A lot of people just want to buy something, plug it in, and start streaming today. XLR setups can be confusing and downright overwhelming to many consumers. They can also be a lot more pricey. As we just discussed, you’re going to need to purchase an audio interface and pre-amp to use with your mic. These additional requirements can clutter up your workspace and are often quite expensive. As I mentioned briefly in my Blue Yeti overview, my personal setup at home cost me over $700. 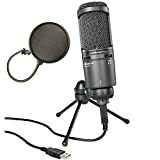 I use it primarily for recording music and voice overs, as well as some streaming and video production. It gives me a great deal of versatility and control when it comes to my recording types and quality. 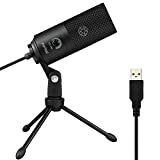 But, if I knew I was just going to be doing some light streaming, I would definitely have gone with the Blue Yeti mic and saved myself almost $600. As usual, if you care enough to read down here, we’re going to help you pick the best microphone for you! There are several factors you need to take into consideration when purchasing a desktop microphone. In this section we will go in depth to list each factor, as well as what it means and how it applies to you as a consumer! Rather obviously, the most important factor you should be considering when picking a microphone is the audio quality. Especially if your budget is lower, you’re going to be wanting to squeeze every ounce of audio fidelity out of your money. When determining the audio quality of a device there are several things you need to keep in mind. Signal to noise ratio – As a streamer purchasing a USB desktop microphone, this is the primary variable you need to be looking out for. The signal to noise ratio is basically how much noise your microphone makes when there is no sound being recorded. Obviously you want as little noise as possible when you recording your stream so that your voice is clear and your stream is not annoying or low quality. Condenser microphones are very sensitive, and therefore are easier to get a good signal to noise ratio with. It is easy to discern if the Signal to Noise ratio is good just by reading the reviews for your microphone. We only chose to recommend microphones that reportedly could provide decent sound levels without too much noise. Directionality – This one is so important I’m going to give it it’s own section where we talk about versatility in microphones. Directionality refers to how the microphone responds to sound coming from different angles. The following are general microphone audio quality statistics that should not concern you too much as a streamer. Pretty much all the microphones our list recommended had the same frequency response and dynamic range across the board. Frequency Response – Frequency response is a measure of the output spectrum of your microphone in response to stimulus. Typically you want a flat frequency response, or 20Hz-20kHz. These microphones may be referred to as Flat Response microphones, but different frequency response ranges can result in better bass or treble response. Versatility – What are Polar Patterns? Microphones can have a wide variance in how versatile they are. When I’m talking about versatility, I’m referring to how many different recording situations a mic can excel in. The Polar Pattern of a microphone, also known as the directionality, refers to how the microphone hears things coming from different directions. There are three primary Polar Patterns. Cardioid (Directional) – Cardioid microphones are what you will generally be dealing with when streaming. They are directional, and perfect for capturing sound directly in front of them. Omnidirectional – Omnidirectional microphones are equally sensitive to noise from all angles. This means it does not need to be aimed in a specific direction, it simply can be placed and pick up all sound. The disadvantage of this is that you will pick up all noises, even undesirable ones. Bidirectional (Figure of Eight) – The microphone picks up sound from the front and the rear, but not from the sides. This is perfect for podcasts, lectures and presentations, where you have a subject on both sides of the microphone. For streaming, you’re generally going to want something with a cardioid polar pattern. This is because you only have one audio source: You. Plus, you probably want to drown out noise from your speakers and the background. A cardioid pattern will allow your viewers to hear only what is coming from your general direction. However, if you are not streaming, different polar patterns may be more appealing to you. If you will be hosting a podcast with guests, a bidirectional microphone may be more appealing. In our opinion, this should be the last factor you take into consideration when purchasing your microphone. However, your opinion may differ than ours. Your Desktop microphone is something you’re going to be seeing every single day, and your viewers will be seeing it as well! This aspect of your microphone also has some influence on build quality. We prefer to recommend microphones with metal construction over plastic or other materials. They are more durable, sturdy, and will be much less likely to crap out on you if you accidentally drop them.